As I had expressed the vivid desire to see the much praised Lake Biwa, we moved with the Tokaido railway there. After a short drive through the inevitable rice paddies when — we had just passed through a tunnel and made a sharp turn to the North-east — the lovely lake lay in front of us shined upon by the rays of the morning sun. At Baba Station Baba the railway car was exchanged for a court carriage that took us to the city of Otsu at the lake shore, the capital of the prefecture of Shiga and the province of Omi, which was already part of the landscape of Tosando, that is the East mountain road. This city has become notorious quite to its own dislike for the wicked assassination attempt in 1891 that was made in one of the streets we were passing through, on the Tsesarevich. This circumstance accounted for the fact that here there were even more police guide lines and instructions to follow. The place was teaming with policemen everywhere. Lake Biwa is said to owe its name to its form that resembles the instrument named „biwa“. Numerous myths are connected to this lake that plays an important role in Japanese tales and is said to owe its existence like Fuji mountain to an earthquake. With its blueish glittering surface the lake is lovely embedded between green hills and groves. Small villages enclose the shores as the pleasure-seeking Japanese knew how to appreciate the scenic magic of this jewel. An idyll lies in front of us and in the spectator the desire grows to stay and dream here for some time. If one discounts the style of the houses, one might think to be transferred to the shore of Lake Starnberg. Numerous steamers and sailing boats drive to and fro, exchanging the traffic between the different points on the lake shore. We embarked on a small steamboat that split the blue waves puffing and groaning — it perhaps had never been driven so fast — but the enjoyment of the trip was unfortunately lessened by incessant use of the steam whistle which seemed to be a bad quality of our vehicle or more precisely that of our commander who by the way was only following the ruling custom: Every encounter, every greeting, every signal is accompanied by the shrill whistle. At Karasaki, not quite 6 km West of Otsu, at the lake shore we stopped. The point of attraction here is the famous pine that is said to have already been planted before the birth of Christ. In any case, it dates back to ancient times and justly has become over centuries if not millennia a venerated holy tree. The height of the trunk however is only 27 m, as the tree has been pruned probably in its youth, an early victim of the ideas of Japanese gardening. The circumference of the trunk however is more than 22 m and the diameter of the ends of the branches extends to about 300 m. The branches extend partly far like a fan and are turned down so that one can in some spots only pass under them in a crouching posture, partly they are wound in snake-like coils supported by formal wooden scaffolding and stone bases. Below the branches of the impressive giant and dignified tree is hidden a complete Shinto temple. Where there are holes in the trunk they have been carefully glued closed. Also at the top there is a small roof to protect the tree against the rain as it is said to be very sensitive to it. Still despite all this care, the tree seems to be a bit ill surmised by its look and this year too, caterpillars have inflicted quite some damage on the old man. Near the giant pine we witnessed the local fishing: In the lake are namely installed labyrinth-like paths made out of bamboo latices in conjunction with fish traps so that the entering fish find themselves finally confined to a relatively small space of a few meters in diameter out of which there is no escape. In front of our eyes such a space was emptied which resulted in a catch of multiple hundred kilograms of fish, among them especially carp of respectable sizes. Apparently the fishing is quite profitable here as the lake like all Japanese inland waters is very rich in fish. 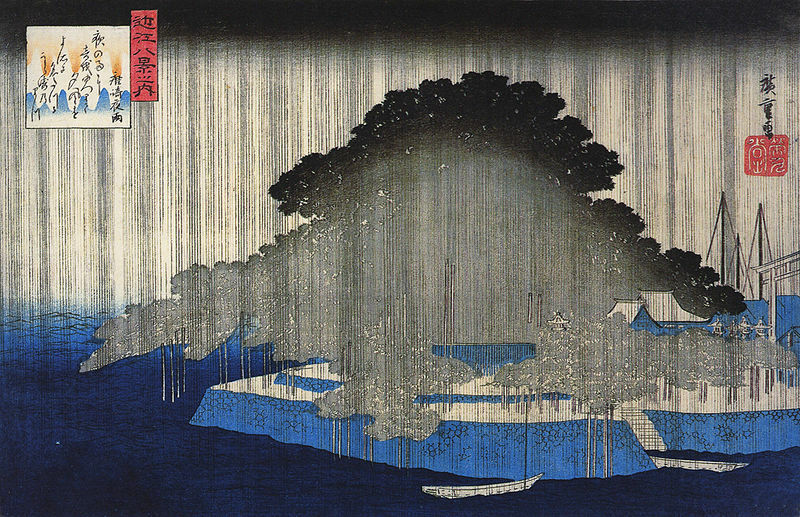 The steamboats driven without taking the slightest regard over the bamboo lattices extending out of the water so that one thinks that they would be crushed and torn. Far from it — the elastic material bends below the fore and body of the ships and rises again unharmed behind the aft of the steamer. Back in Otsu I climbed the numerous steps of a stone stairs to the heights covered with conifers and crowned by a Buddha sanctuary called Mii-dera, which is said to have been built already in the 7th century but has been adapted numerous times. From here one has a gorgeous panoramic view on the lake and the landscape surrounding it. Less charming were the sight of the public buildings constructed in European style that self-confidently if not pretentiously stand out in their brazen white painted exteriors from the surrounding areas. With great appreciation one has to mention a masterwork of modern technology, namely the canal that connects by the Kamo-gawa canal, Kamo-gawa and Jodo-gawa to Lake Biwa and the Japanese inland sea. The highly remarkable installation built from 1885 to 1890 consists of a 11 km long shipping canal that enters into Kamo-gawa to the West of Kyoto and a 8 km long secondary canal that serves irrigation purposes and supplies water power for the various industrial establishments. The difficulties of this structure were to route the canal through the hard rock of the ridge between the lake and Kamo-gawa and then cover the level difference of 44 m. The former obstacle was removed by building three tunnels, the latter by introducing a system of skewed plains on which the vehicles are moved up and down with strong steel cables powered by the hydraulic energy of the secondary canal. The design of this installation was created by Tanabe Sakuro, a student of Tokyo’s school of engineering who has executed the plans and drafts — by the way — with his left hand. While I enjoyed the sight and had myself informed about the canal, a gorgeous daylight firework was ignited so that around us colorful balloons, ribbons and bands were flying through the air. Above a newly built clean barracks occupied by an infantry regiment, an officers‘ casino has been situated on a height. Its location and surrounding makes this the probably most advantageous casino that I have known. It is built out of wood and equipped in the local manner. On the walls hang photographs showing war scenes from the Satsuma uprising as well as dedication tablets with memorial inscriptions and signatures of princely personalities, generals and other dignitaries. I had some of the inscriptions translated to me, some of which apparently are connected to certain events and relations or can not truly be understood by a third party, while others have a roguish air such as for instance the words of Prince Arisugawa: „We will entertain the peasant girls.“ A dinner we ate here tasted very well thanks to the agreeable coolness supplied by mighty blocks of ice and the charming landscape. The departure from Otsu took place at half past 2 o’clock. At Maibara the train turned East towards Gifu. A place that will be commemorated forever in Japan’s history as today one of its railway stations is Sekigahara, where Ieyasu in 1600 at the head of 75.000 men won a decisive victory over the 130.000 men army of the league against him and thus brought the shogunate into the Tokugawa family. After a three hour journey we arrived in Gifu, not without me enjoying a little rest, as I was overwhelmed by the heat on the journey and tired, to which purpose I had dressed as a Japanese wearing only my Kimono which caused much hilarity to the cabin attendants. At the station I was greeted by captain Yamaguchi upon the order of the Emperor. He was the director of the Imperial hunting office called Shurio Kyoku and a chamberlain, both clad in neat green uniforms. Then followed the customary festive entrance into the city. As the people had formed huge crowds, the policemen formed an advance in djinn rickshaws to create space for us. The curious harmless bystanders were hit and run down in a rather rough manner without however any swear words by the victims whose calm found my admiration. The Japanese remain polite in all situations. Notable were the great number of attractive faces that the female part of the population contributed to the embellishment of the entrance. Gifu, the capital of the prefecture of the same name and the province of Mino, has been completely rebuilt as an earthquake in 1891 and the resulting fire had fully destroyed it. It therefore makes a new, very clean and tidy impression. A hill in the East of the city the great Nobunaga had in his time selected as a suitable spot for a fortified castle. The province of Mino is known for its fertility and the industry of its people that reveals itself in the production of silk, silk weaving, crepe, pottery and the paper industry. Mino paper is especially popular for windows. Lampions, sun and rain umbrellas as well as paper napkins are desired articles. In a club house all the mentioned goods were offered for sale and also various honor presents for me by the city were put on display. The purpose of our visit to Gifu was to see fishing by the trained cormorants. Thus we went soon in djinn rickshaws to the fishing location about one hour of journey outside the city near Nagara-gawa. The journey followed the main road of Gifu, crossed a pretty bridge over the Nagara and continued on the right shore upstream past charming small houses surrounded by tiny gardens as well as bamboo bushes. The lampions for the evening activity were already visible and increased the expectations of a splendid illumination. At the place where we were asked to embark a covered and richly decorated and illuminated boat was already waiting. In it an excellent dinner was served when we had reached the middle of the river as the fishing would only start at dusk. The Japanese court cookinng merits special appreciation as they did everything but let us die from hunger. All the time there was something readily prepared for us, a constant „Tischlein deck‘ dich“ (Grimm’s fairy tale „The wishing table“). Both river shores were densely packed with people who had come to watch the spectacle and numerous boats filled with Gifu’s dignitaries and multiple reporters some of which were always accompanying us were dancing on the waves of the river. It is here 30 to 40 m wide, with a strong current, and forms rapids in the upper part where granite blocks constrain its path similar to those at Katsura-gawa. It reveals its character as a mountain river especially by the extended inundated areas that points to devastating activities of the river in spring. When it had turned completely dark our vehicle was pushed a few hundred meters upstream until at a rocket signal 12 boats of 6 m length each emerged out of the turn of the river. A mighty chip of pinewood fire was burning in a iron basket at the fore of each ship in order to attract fish. There too stood a fisherman who held eight cormorants on strings ready while on both sides a fisherman each held two cormorants on two strings and a fourth man steered the boat, I was told that the cormorant is captured young and only tamed so far that he is tame to the hand that is eat out of the hand and allows to be touched. As soon as this achieved, it is used to catch fish and namely in the manner that a sling around its neck prevents its flight when it is sent into the water to catch fish and store them in its craw. The bird does this eagerly out of his instinct. To prevent the fish from going from the craw to the stomach the string is tightly wound around the neck. If the cormorant has caught a number of fish and stored in its craw, the bird is lifted back on board and deprived of its catch by the owner applying pressure to its neck. Thus it happened here too. When the shine of the flames had attracted a sufficient number of fishes, the fleet started moving. At the same time the strings holding the cormorant were eased and the prey-seeking birds started diving without interruption and incited by our beats on the boat’s walls or our shouts in their murderous hunt. A night time view of a strange charm developed in front of us. The boats drifting towards us, the up and down diving cormorants in front of the boats of which soon one or another was lifted into the boat in order to get its catch and release it back into the water. The exciting shouts and noises of the fishermen and the crackle of the fire illuminating the darkness of the night over a wide area. The numerous vehicles mingling on the river and the crowds pushing on the shore in the red shine of the flames. When the boats arrived near us, taking our vehicle into the middle and drifting further downstream we could closely observe the cormorants at their work. The fires illuminated the water to the ground of the river bed. Terrified schools of fish hurried around always pursued by the cormorants. There was especially vivid action under water if two cormorants started to chase the same fish so that a true competition began until one of the birds emerged victorious. We too started to get excited and took sides in the fishing so that we encouraged the cormorants by shouting what actually was not necessary at all as the brave animals caught in the hunting fever rushed back head first into the water having barely been lifted on board. Captain Yamaguchi was very happy about our interest which was not lessened when I standing up and due to the pitch of the boat poured a cup of black coffee into the lap of this brave man. Recognition is due to the skill of the fishermen in performing their job in steering their boats in the strong current and how they manage the cormorants so that they can dive in all directions without messing up the long strings. With a one hour time period the 144 cormorants had caught 3000 fishes some of which were so large that the diving birds were unable to get them without a struggle. Under our own eyes one cormorant had no fewer than 16 fishes in his craw — a number that stands out of all proportion to the size of the bird. The caught fish were all salmonidae that are all treasured and a favorite dish of the Mikado on whose table they apparently were never missing. At the dinner in the boat I had the opportunity to taste fishes of this species. We found them tasty but not as exquisite as our trout. The fishing grounds where we had fished is owned by the Emperor while other places are owned by the city or private persons. For the nearly fantastic wealth of this river and probably other waters in fish speaks the circumstance that this fishing method we witnessed today is used during five months every night with the exception of clear moon nights and the average daily catch is 5000 to 10.000 pieces of fish that are immediately put on ice and then sent into all parts of the country. Despite this robbery — the cormorant is one of the most ruthless predators that catches everything that comes near it without distinction — the fish stock always replenishes itself again. This can only be due to the very favorable circumstances for the fish fauna in Japan as there are neither close seasons nor other measures to improve the fishing. One clear explanation is that the pollution of the fishing waters by industrial establishments has not yet happened or not in the same amount as at home. Both river shores were packed with humans near the bridge. The people even ran into the water to be able to see us, the water reaching up to their chests. The crowd there was buzzing and humming like a bee hive, soon there and soon here, clear laughter was heard and vivid shouts of approval reached our ears — all these sounds and noises combined with the gushing and roaring of the river to form a strange harmony. The city of lampions seemed to want to surpass its fame. They said good-bye with an illumination that surpassed all expectations. Alongside the river shore as well as on the bridge thousands of red lampions had been lighted. Above the roads audacious arches were formed from which hung garlands of lampions gleaming in light red. The bizarre forms of the temple roofs as well as the fronts of the houses fiery lines made out of white lampions were formed. In the streets everywhere there were illuminated banners. Red and white glittering and gleaming out of all directions made the quarter up to the station appear to be bathed in light forming a stark contrast to the dark night sky. Led by the mayor and followed by a huge crowd, the long caravan of djinn rickshaw moved to the station where the mayor of the city thanked me for visiting Gifu. After I had replied with a few words, the train took us on the Tokaido railway in a South-eastern direction to Nagoya. Here I was greeted by division general Katsura in fluent German that he had learned during his stay of many years in Vienna which he holds most dear in his memory. During the entrance into the city a firework was ignited, this time a night time one that has to be counted among the most beautiful that I have seen. In spite of the advanced hour the inhabitants of Nagoya had assembled in huge crowds in front of the hotel where we would stay the night and applauded vividly when I accidentally appeared on the veranda as if I were a famous opera diva. I then bowed to thank them. ANNO – on 14.08.1893 in Austria’s newspapers. Dieser Beitrag wurde am 14. August 2018 von wordpressadmin in diary veröffentlicht. Schlagworte: August, Japan, sightseeing.